Nicole Bonia | A personal journal, but online. I still haven’t conquered my joy at the lengthening of the days. I did so many fun things over this past week that it would have been a great week anyway, but sun, ya’ll! I attended a friend’s birthday party at The Royal Palms Shuffleboard Club out in Brooklyn and that place is so much fun! In addition to shuffleboard they have other games that you can play while you wait to play or have finished playing shuffleboard, a great white bar with records & a dj (pictured above), and a delicious Mexican food truck (I ate all the chorizo.) We were in it for the long haul. After Royal Palms we headed over to Pig Beach for a barbecue dinner and then Union Hall to play bocce. Let’s see, what else? Gayle and I interviewed Washington Post columnist Ron Charles for an upcoming episode of The Readerly Report and we recorded our book club episode on Becoming by Michelle Obama. It was a busy week of podcasting. I went with a friend to Rossopomodoro. I usually go there for pizza and wine but I had their rigatoni with braised short ribs, and it was so good. You should go! I discovered that it’s an Italian chain, and they have locations worldwide. Of course, I go to the one in the West Village. I had some fun reunions over the week. One with some books club ladies in the publishing business that I have known for awhile. We usually have so much going on and so many books to read that we struggle to finish the book, and this month was no exception. But we did have a fun photo shoot with my friend’s dog. 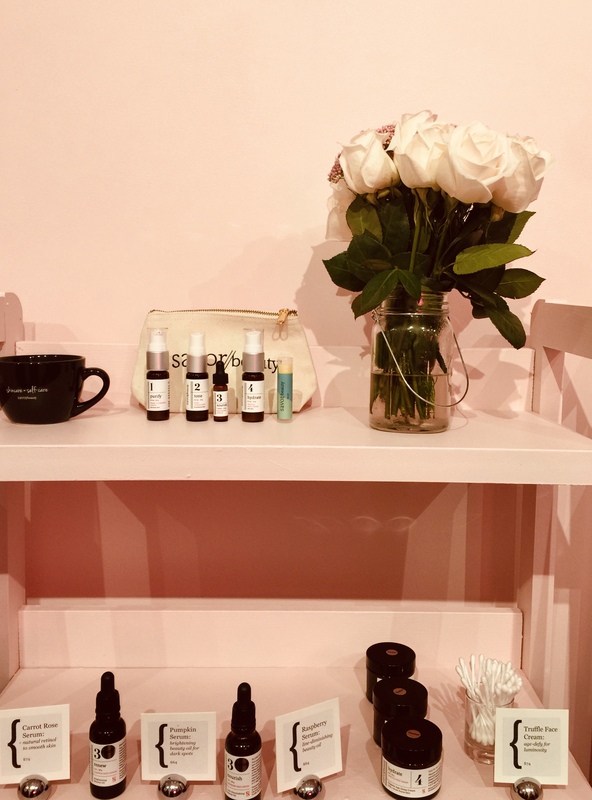 Savor Beauty & Spa had an event at their pop-up shop in Soho that I attended. They are a natural and organic skincare line. Their products appear to be well formulated and light on the scent. I am not buying much new skincare right now as I have a bunch products I want to finish first, but I will be keeping them in my back pocket for new things to try. I really loved the truffle face cream and I may also get a bottle of this. Last night my outing was dinner with friends at Fedora (one of my neighborhood favorites) and then karaoke.